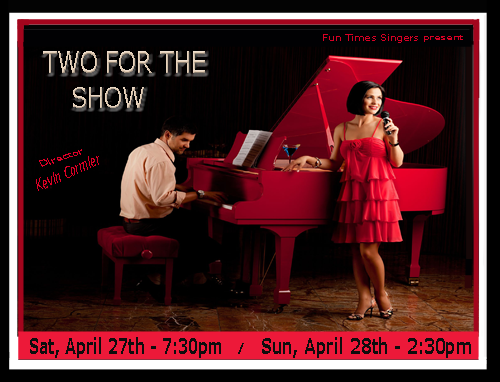 2019 Spring Concert - "Two for the Show"
The Fun Times Singers will perform our Spring 2019 concert "Two for the Show" at 7:30PM Saturday, April 27th and 2:30PM Sunday, April 28th at the Shir Hadash Temple in Los Gatos. Our program will include a collection of songs either written by or performed by well known collaborative pairs; you might call them dynamic duos. Children 5 years or younger accompanied by a paying adult are admitted free of charge (but may have to sit on your lap if we have a sell-out concert as we often do on Sunday afternoon). We use General Seating meaning that tickets are not associated with any particular seat. Also, our Sunday afternoon concerts have typically been Sell Outs and our policy is that if you have not occupied your seat by 10 minutes before the concert, we may release your seat to guests on our wait-list. The wait-list is created a half hour before doors open for the concert and is a first-come first-served list. If you subsequently arrive late and there are no more seats available, we will offer you a refund of your ticket purchase price. To ensure that you can get a seat, we encourage you to purchase your ticket in advance from your Fun Times Singers aquaintance. If you are particular about your seating choice, come early (doors open a half hour before the performance) because seating is unassigned and seat selection is on a first-come-first-served basis. The only exception to the above seating policy is if you are the activities director for a senior residence and wish to bring 5 or more of your music loving seniors to our concert as a group activity. If you are arriving in one vehicle, please contact us and we will make every effort to accommodate your group outing. We can reserve seats for your group that are close together near the aisle to facilitate the management of your party. However, you must arrive near the time the doors open; we cannot hold your reserved seats indefinitely. There will be a reception after the concert so plan on joining your Fun Times Singers friends after the performance for cookies, coffee and punch. Our Summer concert is scheduled for August 10th and 11th at Shir Hadash, Los Gatos and will have a big band theme. You can get a feel for the kind of music we sing by looking at the repertoire of some of our past concerts. Click here to take a look.